Please click here to tell us (briefly) about your idea. 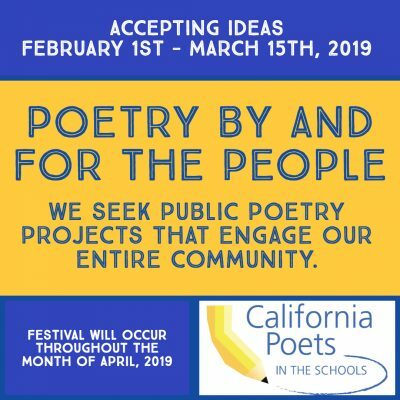 The “BIG” goal for the Sonoma Poetry Festival is for everyone in the county to encounter a poem in April 2019. With this in mind we are seeking public poetry projects by the people, for the people, with a wide reach. We aim to reach the priority neighborhoods as laid out in the Portrait of Sonoma County (Cloverdale, Northwest Santa Rosa, Southwest Santa Rosa, Southeast Santa Rosa, The Springs (Sonoma) however PROPOSALS FOR ALL SONOMA COUNTY NEIGHBORHOODS ARE ENCOURAGED! -Projects must occur between April 1st and April 30th, 2019. -One must be over 16 years old to submit an idea. -Those 16 and under are encouraged to submit ideas in partnership with an older collaborator. -Projects should be public in nature and aim to reach a wide audience. -Collaborations with other arts disciplines and nonprofits are encouraged!